You may have heard the city of Oregon, Ohio. Yes, there is a city named Oregon in Ohio. One resident wants to change the city name on January 12 and be known by something different than Oregon. One suggestion under discussion for a new city name was “Buckeyeville.” Yeah, that’s real creative. I like “Urbania” better. How about changing the name to Corvallis? Either way it’s not going to change the outcome of the game. The Buckeyes deserved to be the No. 4 team in the playoff, and so did TCU. Unfortunately for TCU fans, very few people outside Texas know if TCU’s mascot is a Horn Frog or the Horned Frogs. Can you name a previous head football coach at TCU head football, other than current coach Gary Patterson? Try naming a few TCU players in the NFL? 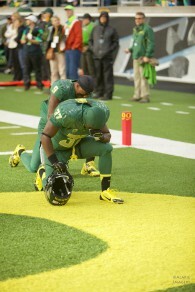 Duck prayer in the endzone. TCU reminds me of Oregon during the 2001-02 season — great team and they deserve a shot at the championship, but one loss and national rep at the time cost ’em. One game? Not so fast my friend. Maybe it was one game to some people, but anyone in Oregon territory has seen this for a decade plus. I want to stress, the national media is starting to get it, but slowly. Lou Holtz still can’t pronounce Oregon correctly (or-REE-gone, Holtz says), so don’t expect too much too soon. If I hear one more commentator reference the fact that Oregon is 0-8 all-time vs Ohio State in football I’m going to drive to Union Cemetery in Columbus, Ohio, and paint Woody Hayes’s tombstone maize and blue. I offer this up as evidence to the national media that Oregon has as much muscle or more as anyone in the power 5 conferences. Go back to 2002 and watch Oregon outmuscle Colorado in the 2002 Fiesta Bowl. That was a Buffalo team that lit up Nebraska for 62 points and four billion yards on the ground. It might have been three billion, but I’m close either way. The Buffaloes looked like, uh, well, buffaloes pounding the physical Cornhuskers into cornflakes. Wait a minute, I think Chris Brown just ran 50 yards for another touchdown. By the way that Nebraska team that Colorado Vitamixed is the same one that played Miami for the National Championship. Colorado got nothing against Nick Allioti‘s defense at the Fiesta. 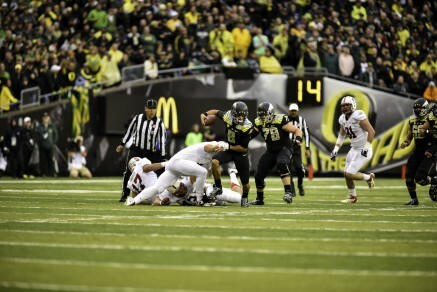 Mariota breaks a tackle against Stanford. The alleged most physical team in the Pac-12 some would say is Stanford. Just because you can’t pass the ball consistently doesn’t mean you’re the most physical team in the Pac-12. 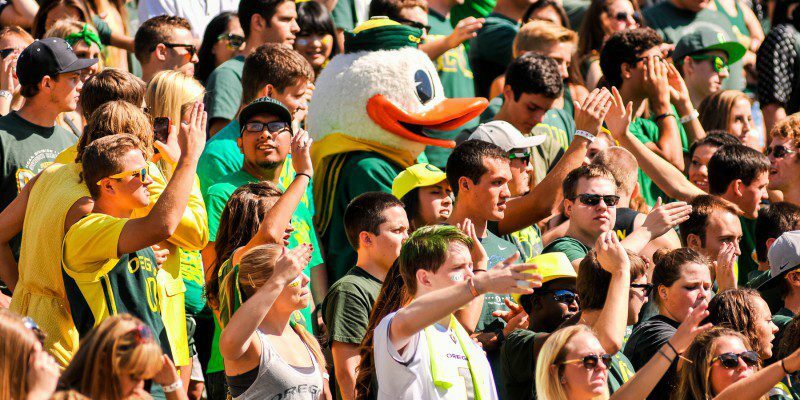 Oregon is 10-3 vs the Cardinal since 2002. That’s 10 wins and three losses. That’s a 77% winning percentage. How about top competition in top bowl games? Remember those big corn fed boys from Kansas State who were supposed to pound the ball against Oregon in the 2013 Fiesta bowl? (What’s the big deal about being corn fed anyway? I bet Keith Jackson knows the answer.) The Wildcats tried to ram the ball down Oregon’s throat running 37 times but came away with less than 150 yards. How about running power house Wisconsin? Oregon outrushed the Badgers 345 yards to 212 in the Rose Bowl three years ago. Let’s throw a loss in there, to Auburn and Cam Newton. The Duck defense holds the Tigers to 22 points. What did the rest of the SEC give up to Auburn each game that year? 40 points! I’m not even going to do a deep dive into recent Oregon bowl wins such as victories over the Texas and Oklahoma State from the Big 12. That said, close your eyes for a moment. Can you still see Jeremiah Masoli running over that poor defensive back for a score? When my kids are worried about having nightmares at bed time I pray with them and then show them video of “The Pick” or this gem. Happy thoughts. God Bless Jerry Allen! I’m loving the Oregon vs Ohio State hype thus far, but that comment about the Ducks being 0-8 lifetime against Ohio State is still driving me nuts. Seriously, are we going to count games going back to the Eisenhower administration? I like Ike, but is the 1958 Rose Bowl loss to Ohio State relevant here? The score was 10-7. It was 1958. Gas was 24 cents a gallon. Was Mark Helfrich even alive then? Was Coach Gary Campbell wearing sharp suits back then? Enough with the 0-8 lifetime record against Ohio State. You know who usually gets it right? Vegas. They’ve got Oregon as a 7.5 point favorite and look for that number to go up. My Vegas expert Mike Whitmire tells me that the top Casino’s start each day with $1 million in overhead. Do you think they know a thing or two about this game? Oregon has not only won 10 games in a row, but has covered the spread nine of those times.